Andrew Luck is the ultimate prize for whatever NFL team manages to lose enough to get the #1 overall pick. 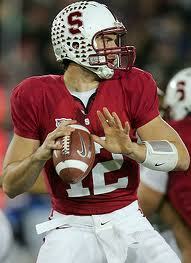 1- Andrew Luck, QB, Stanford– Did you expect anyone else to be #1? He’s the best QB prospect I’ve seen since I’ve been scouting and he’s a great bet to be the #1 pick in the 2012 Draft should he declare after this season (and there have been rumblings that he will). 2- Matt Barkley, QB, USC- Barkley has been on my radar since he was a true freshman at USC. I was never sold on Aaron Corp and while I thought Mitch Mustain had potential as a sleeper before his off-field issues, I always thought Barkley was the most talented QB on the roster once he got there. That has proven to be true, and he has continued to develop in a pro-style offense since emerging as the starter during his freshman year. Now in his junior year it seems there is a strong chance he will declare. I wouldn’t be surprised if he did, but I think there is a small chance that he comes back to take a run at a Rose Bowl because their bowl ban will have expired. Part of me wants him to stay, but there isn’t much left for him to prove outside of leading his team to a great season with a post-season win. 3- Ryan Tannehill, QB, Texas A&M- Tannehill flashed incredible upside last year leading Texas A&M to a furious finish before ultimately losing to LSU in the Cotton Bowl. He hasn’t had the same incredible start this season but he has still flashed potential. He doesn’t have much experience but as he continues to develop he could become a quality NFL QB. He has quality tools such as arm strength, accuracy and athleticism. Plus, he seems to be a guy with quality intangibles and leadership capability, so even if you need to develop him for a year or maybe two he has the upside physically and mentally to warrant early round consideration. Russell Wilson might not be rated this high by other draftniks, but he's a great QB. The only serious knock on him as a prospect is his height. 4- Russell Wilson, QB, Wisconsin- Russell Wilson won’t be this high on many people’s rankings, but I was one of the people that was wholeheartedly convinced that he would be a spectacular quarterback for the Wisconsin Badgers and I said just as much in my post that I wrote shortly after it was announced that he was going to play for them this year. I didn’t think he’d be this terrific so early, but that really speaks to his fantastic intangibles and leadership qualities. Wilson’s only knock as a prospect and as a quarterback is his lack of size, as I would estimate he is about 5’10” or maybe slightly taller. 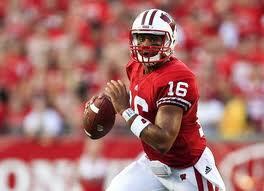 That will make his transition to the NFL more difficult, but he is a very talented quarterback. He’s got very good arm strength, has accuracy to all levels of the field, throws a very nice deep ball, can make any NFL throw, and has demonstrated quality pocket poise at times. I think he could stand to improve as a passer with pressure around him when he’s in the pocket, especially when there is pressure at his feet. However, he is very athletic and uses his athleticism to extend plays and is great at making plays outside of the pocket. He may not be an ideal quarterback for a West Coast offense that requires frequent three step drops and throws as he will struggle to find throwing lanes at times and he may have problems with passes getting batted down at the line of scrimmage. But if he is drafted to a team with an offensive coordinator who knows how to get him out on the edge and make effective use of his athleticism and ability to throw on the move he could be a very dangerous quarterback. I know I won’t be betting against him simply because I know how hard he works and how well he assimilates into a new team. He became a leader of this 2011 Wisconsin Badgers team after being an official member of the roster for two months when it takes many quarterbacks two years if they can ever even become a captain. People have really underestimated how difficult and rare it is for him to do what he has done so far this year. Without sounding like a rabid Russell Wilson fanatic, it really is nothing short of incredible, not to mention very, very rare. 5- Robert Griffin III, QB, Baylor- As skeptical as I was of Griffin before the season based off of the film I watched of him last year, you can’t help but be impressed by the unbelievable statistical start to the season he has had. I’m still skeptical of the offense he operates in, but it’s very clear that he has developed since the end of last season. Due to his arm strength, improving accuracy, fantastic athleticism as well as his reputation for being a very intelligent, disciplined guy as well as a film junkie NFL talent evaluators and Draftniks alike are going to be salivating considering his potential. He still has strides to make in my opinion, but he has definitely progressed since last year. I’d be a fool to try to ignore that, so even if I still need to see more of him I can at least acknowledge that. 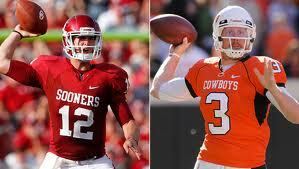 Landry Jones and Brandon Weeden are directing two of the most explosive, high-scoring offenses in the nation. 6- Landry Jones, QB, Oklahoma- Landry Jones is a talented quarterback with quality size, arm strength and accuracy. His accuracy becomes more erratic when under pressure, however, and doesn’t seem to react well to pass rushers in his face. That is concerning for a NFL draft prospect, and it is the reason I might have him lower on this list than some other people do. He’s a quality prospect, I’m just not a big fan of him personally. He’s got upside, I’m just not sure he will ever be a quality NFL starter. 7- Brock Osweiler, QB, Arizona State- Osweiler is a junior with only seven games of NFL experience up until this point, and he has a huge test upcoming against Oregon this Saturday. He’s got a fantastic combination of size and arm strength (reminiscent of Ryan Mallett to be perfectly honest) and his accuracy looks significantly improved over last season. He’s not very mobile, but he has a terrific arm and he’s progressing in the mental aspect of the game. He’s got a boatload of upside, and I’m personally a pretty big fan of his. I’d be surprised if he declared this year, especially since he would have a maximum of 16 games of starting experience at the end of this year, but if he did I would definitely expect him to get drafted in the 2nd or 3rd round range. But if he comes back I would be surprised if he didn’t end up in the 1st round discussion for 2013. Geno Smith is quietly establishing himself as a quality NFL Draft prospect. He may not have had a fantastic game against LSU, but putting up 468 passing yards against that defense is definitely worth mentioning. 8- Geno Smith, QB, West Virginia- Geno Smith was never someone I was particularly high on, but watching him put up 463 yards on LSU’s fantastic defense definitely opened my eyes. He was carving them up with downfield passes and showing off an impressive arm, and even though WVU was losing for most of the game he never stopped coming (even after they had been made into a one-dimensional offensive attack due to their struggling running game and the scoreboard). He wasn’t incredibly efficient as he threw 65 passes and completed only 38 of them (58.5% completion) and threw as many touchdowns as interceptions (2). One of them came on an incredible play by Tyrann Mathieu, but overall I was impressed with Smith. He looks very skinny on film, and I’d be surprised if he declared this season, but he definitely has upside in my opinion. 9- B.J. Coleman, QB, Chattanooga– Coleman definitely has upside, but he needs development. I don’t think he’s ready to step into a starting spot in his first year or two, but he’s definitely worth a mid-round pick. He has a strong arm, quality (but sometimes a bit inconsistent) accuracy, great size and some pocket poise. He just needs coaching and development, but he doesn’t have incredible upside in my opinion. 10- Brandon Weeden, QB, Oklahoma State- Weeden is a solid prospect but his age is going to make it hard for him to crack the top three rounds just because of his limited upside. How much better is he really going to get before he’s 30? He will improve with coaching, but at best he has a 5-7 year window as a starter once he gets to the NFL, and that’s assuming he sticks as a starter in the first place which as everyone knows is not guaranteed. He can stretch the field, he’s accurate and has been a key cog in one of the most explosive offenses in college football over the past two years, but his upside is limited due to his age and that makes him a mid-round guy. 11- Ryan Lindley, QB, San Diego State– Lindley is a guy that I identified as a player with upside that needs to improve in some areas. Right now he’s a mid-round guy with plus arm strength but inconsistent ball placement. He has upside due to his combination of solid size, quality arm strength and his athleticism but his accuracy is only above average at this point. He has struggled with ball placement as a junior and so far as a senior at times. He has a live arm so he definitely has upside, but if his accuracy doesn’t continue to develop then he won’t live up to his potential. He’s a developmental guy at this point with more upside than most mid-round QB’s. 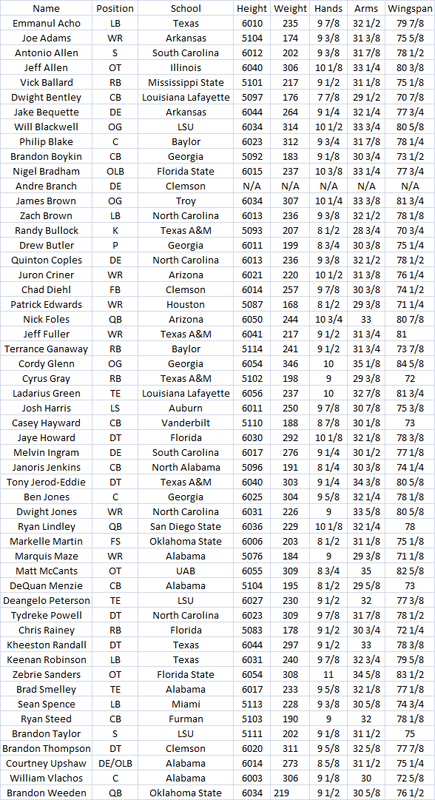 Kellen Moore doesn't have much arm strength, but his other quality attributes make him draftable in my opinion. 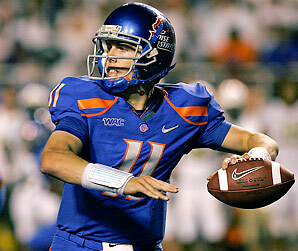 12- Kellen Moore, QB, Boise State- Kellen Moore is an interesting guy because even though he is a smaller guy with very average arm strength I still think he has a shot in the NFL. I wouldn’t peg him as a starter in his first two seasons by any means, but he has quality accuracy, he’s very intelligent, he plays well in pressure situations and he’s got a vast amount of experience. He will have to transition from the spread offense that he has played in at Boise State, but because of his intangibles I don’t think that will be as big of a road block as it is for some spread QB prospects that attempt the same transition. He’s a fourth or fifth round pick in my opinion right now but he’s definitely got the upside to stick in the NFL. 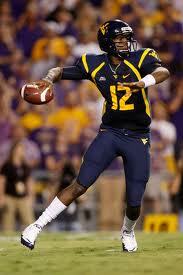 I’m not sure he will ever be a quality starter, but with his intelligence I think he can be a back-up QB in the NFL. I’m just not sure he has the arm strength to threaten defenses downfield and that can spell disaster at the NFL level. 13- Kirk Cousins, QB, Michigan State- Cousins is a guy I’ve been paying attention to since he was splitting snaps at QB with Keith Nichol as a sophomore and while he is definitely a NFL prospect I’m not as high on him as I thought I might have been. He hasn’t progressed like I was hoping he would and while he has the potential to stick in the NFL I would not bet on him being a quality NFL starter right now. 14- Chandler Harnish, QB, Northern Illinois- Harnish showed some ability when I watched him last year and while I haven’t had a chance to see him this year I definitely think he can stick in the NFL. I would like to see more consistent accuracy and ball placement from him before I would project him as a potential starter in the NFL, but I haven’t seen him play this year so I can’t speak to his progression from his junior to senior year yet. 15- Nick Foles, QB, Arizona- Foles is a prospect that you seem to either really like or completely dislike. I am personally not very high on him and I think that people putting 1st, 2nd or even 3rd round grades on him are vastly overrating him. He’s got good size and arm strength, and he’s accurate on short throws as well as medium throws at times, but the offense he plays in makes him look better than I think he really is. I’m definitely not high on him, but his size, arm strength, experience and production should get him drafted. I just don’t think it will be nearly as early as some people think.